This is a story about USXC’s Ride-Along class for parents whose kids will compete the 2018 I-500 cross-country race. Parents who desire to can literally ride behind their kids for the entire 150-mile Day 3 portion from Thief River Falls to Bemidji, Minn., that comprises the Junior class. But before we can talk about that, I need to tell you a story. 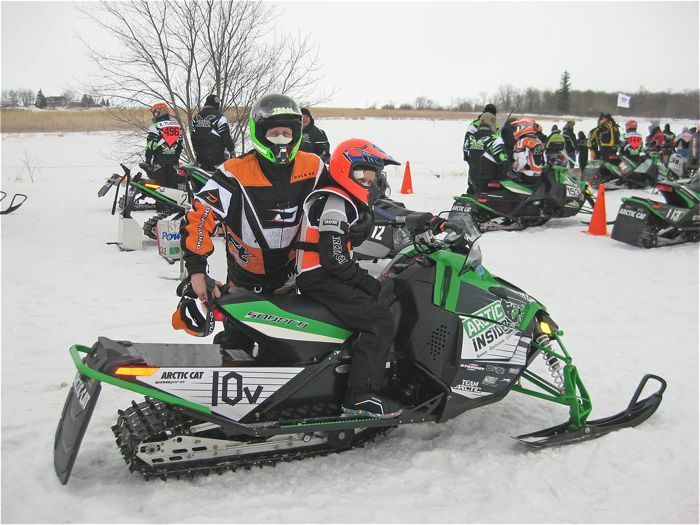 In the late winter of 2011, my then almost-10-year-old son Calvin had demonstrated enough desire, skill and sensibility that I was going to allow him to enter his very first snowmobile race: a USCC cross-country in Warroad, Minn.
My decision was met with great enthusiasm by Calvin. His mom (my wife)...not so much. She didn’t say “NO,” but she sure implied it. My own psyche wavered somewhere between the two. 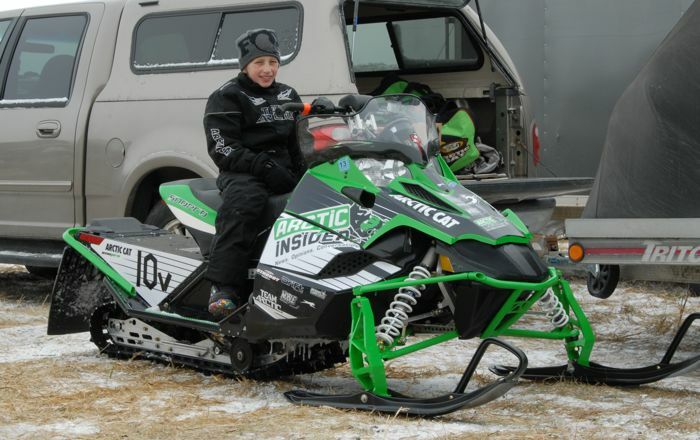 We had a 2010 Arctic Cat Sno Pro 500, an 85-hp machine that Cal had ridden with great skill and control that entire winter. USCC Junior 10-13 class rules at the time required a speed-limiting kit consisting of a different throttle lever and a gear reduction via chaincase gearing and different track drivers. A colossal cheapskate, I skipped the official (and slightly expensive) kit, using a piece of rubber taped to the right hand grip that prevented the throttle from moving past the roughly half-way mark. Good enough, I thought. I had no illusions that Cal would finish high enough to capture the attention of the tech man, who would have no doubt tossed us for not having the official kit. 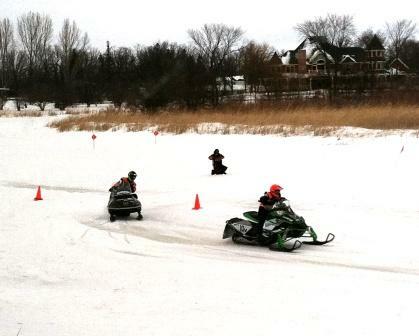 The Sno Pro 500 was stock other than my MacGuyver throttle block and some studs in the track. As we drove to Warroad for the race, my worry wasn’t an observant tech man. Nope – like most parents who are planning to lie about their kid’s age (only by 3 months!) so that the kid could race a 500-lb. snowmobile at speeds that could reach upwards of 60 mph on terrain that would comprise some fields and swamp and lake – my concern was for Calvin. How would he handle a course that would surely be blown to smithereens by the time he raced it, with everything from long sections of dirt, to glare-ice corners and whooped out snow in the cattails? What would he do if his goggles fogged up? Would he even be able to see the course markers? And a dozen other similar questions. As we drove I coached him through as many of the scenarios that I could think of. But I knew in my heart that the best pre-race strategies are often left at the starting line. He’d be out there, mostly alone, and would have to fend for his almost-10-year-old self. Thinking back on it now, it sounds a little bit crazy and reckless. And, again looking back, it was probably a bit of divine intervention that I also brought my vintage El Tigre to race, and that the Vintage class started a couple minutes or so after the Junior 10-13 class. I remember the both of us in staging just minutes before our race. Friends came up and give us thumbs-up signs and a few words of encouragement. I told Cal to have fun and ride in control. I told him that I loved him, gave him a hug, then off he went. Holy crapeth! Moments later, the green flag dropped for me. And about halfway through the first of two laps, just as I was catching up to Cal, I made a decision that I’ll be grateful for the rest of my life: Instead of racing my own race as fast as I could, I got to withing a couple sled lengths from him...and stayed there. And for the next 30 some minutes, I was ENTIRELY content to watch his very first race from the absolute best seat in the house. I vividly remember watching him bounce around on that sled, hitting all the fun and occasionally sketchy stuff that characterizes a cross-country race; seeing the back end of his sled kicked-out around some of the corners (not enough studs, dad! ); and the unexplainable pride that came from watching my son, my boy, fulfilling a dream of his (and of mine). And I’ll never forget seeing him veer off the course on the portion that was on Lake of the Woods, unable to see the next course arrows due to the overcast conditions. Had I not zoomed up to him and pointed him back onto the course, he might have gone a looong way out onto the lake. Gives me a shudder just writing about it. Cal finished the race, triumphant in his accomplishment. He was so pumped about it! I had tears of joy for his having had the experience, for having been able to witness it, and for his safe return. I don’t remember, but I was also probably relieved that, since Cal was fin, my wife wasn’t going to kill me. And so began what would become our winter weekend ritual for the next five years. Together, we had a blast “going racing.” Absolutely some of the best times of my life. That long tale about me following Calvin at his first race is the prelude to a much shorter but infinitely more important story about this year’s USXC I-500. For the first time ever, a parent will be allowed to follow their daughter or son in this epic cross-country race. On Feb. 10, 2018, they’ll witness their kid tackle every ditch approach, every turn of the river and every section of trail that comprises the 150-mile run from TRF to Bemidji. And they’ll be there if junior has a crash. They will experience every thrill and relief that I felt that day in Warroad in 2011, only on a much grander scale. Believe me when I say that an experience like this will make a lifetime memory while massively reducing the fears and anxiety that a parent understandably feels when their child hops on a snowmobile to chase a distant finish line. Oh, and anyone who does this is also going to have a BLAST riding one of the coolest courses/days in the long, storied history of cross-country. Click HERE to jump to the USXC website page about the Ride-Along Class. Click HERE to hit the USXC website, where there are several updates on the I-500. Holy Crapeth!, What a great story John! Awesome write up!!! How the years go by...I would encourage anyone who is even remotely interested to check into this, as well as the "ditchbanger " class that will ride the last segment of the I-500 as well. The stupid amount of fun you will have is off the chart. It doesn't cost a fortune either. The course is REALLY fun, well marked, with a huge number of spectators. Sweepers behind the riders, and a ton of help very close if you need it. Ride as fast as you like with official government approval with nobody coming the other way!!! There is already snow on the ground in Bemidji! John, I still remember that day and when you finished following Cal. The excitement and emotion you shared with us in the pits was great. You told me it was better than any victory or accomplishment you did on a race track. It was moving to listen to you as we loaded up the sleds at the end of the day. I am looking forward to following my son in this years race. Great story! This ride along plan sounds like a great idea! Truly a Kodak moment, "The times of your life" that you will NEVER forget! Great idea from USXC and great story John & Cal. What a great idea!! Congrats to you and Cal, John. There is nothing like racing with your son, and sharing the unforgettable memories. The I 500 has got to be the best race going, many thanks to those hard workers who make it possible and congrats to you and Cal for your accomplishments.